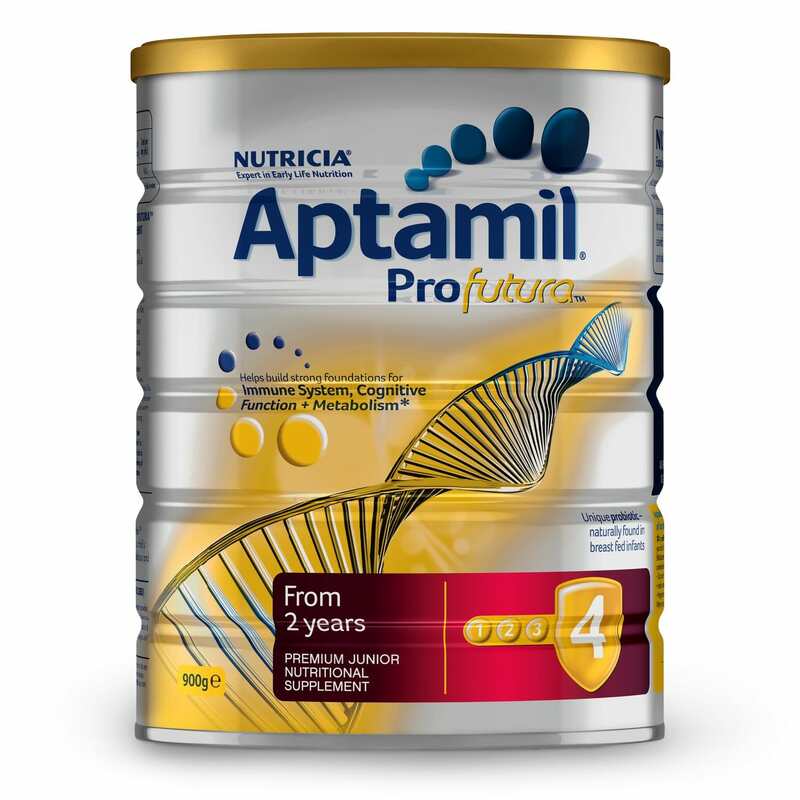 Aptamil® Profutura Stage 4 Junior Nutritional Supplement is specially designed for active children from 2 years of age when their dietary intake may be inadequate. Aptamil Profutura is Nutricia's most advanced formulation and scientifically researched to help build strong foundations for Immune System, Cognitive Function and Metabolism. It contains omega-3 DHA fatty acids and the probiotic Bifidobacterium breve M-16V similar to that naturally found in breast fed infants. Blend 1 cup prepared Aptamil Profutura Junior Nutritional Supplement with your child's favourite fruits, and freeze to make delicious and nutritious fruit ice blocks. Formulated supplementary food for young children. Specially designed to supplement the normal dietary needs of toddlers, when their nutritional intake may be inadequate. Dental Hygiene: Encourage your toddler to drink from a cup from 1 year and to drink water regularly. Take your child for a dental visit regularly. Milk solids, galacto-oligosaccharides (contains milk), maltodextrin, dried omega LCPUFAs (contain fish, milk, soy, antioxidant (sodium ascorbate, mixed tocopherols, ascorbyl palmitate, dl-alpha tocopherol)), long chain polyfructose, glucose syrup solids, emulsifier (soy lecithin), Bifidobacterium breve M-16V. Mineral: Calcium, phosphorus, magnesium, iron, zinc, iodine. Vitamin: Vitamins (A, B1, B2, B3, B6, C, D3, E), folic acid. Minerals: Calcium, Phosphorus, Magnesium, Iron, Zinc, Iodine. Vitamins: Vitamins (A, B1, B2, B3, B6, C, D, E) Folic Acid. 1 scoop = 9.6g of powder. Note: 1 scoop of powder added to 50mL of water yields approximately 58mL of formula. 1. Wash hands before preparing the drink. Wash and rinse cup and all utensils thoroughly. 2. Using the scoop enclosed, add 2 level scoops of powder to 100mL of drinking water. Fill the scoop lightly using the built-in leveller. For smaller volumes simply add 1 scoop to each 50mL of water. 3. Whisk, shake or store the mixture briskly to dissolve powder. Serve immediately, or for a cold drink chill in the coldest part of the refrigerator for 1 hour before serving. For a warm drink, heat slightly before serving. 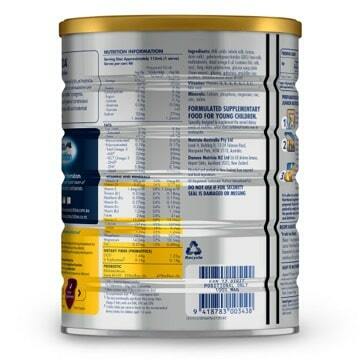 It is safer to use Aptamil Profutura Junior Nutritional Supplement immediately after it is prepared. Discard unfinished drinks. Product is packed by weight, not volume. Some settling of the powder may occur during transportation and distribution. Store in a cool dry place. Use by the date on container bottom. After opening, keep container airtight and use contents within four weeks.